Craig McLaughlin grew up in an all American family in the heartland of Iowa, playing baseball, scooping up crawdads out of the creek, climbing the water tower and hanging out at the playground behind his family’s home in their small town where, if you went four blocks in any direction, you’d be out in the corn fields close to the railroad tracks. His dad was a biology teacher and a basketball, football and baseball coach whose photo still hangs in the old school building. Mom had her hands full with the siblings, three boys and an older, cognitively challenged sister. Like most rural Midwesterners, the family had a large garden with vegetables, wild asparagus and fruit trees to feed the family. Craig recalls the year, during the Cuban missile crisis, that his father turned the root cellar into a bomb shelter. Through high school, Craig had a job in the local grocery store and played coronet in the marching band. There wasn’t much to distract teenagers in his town of Knoxville so Craig’s clan of friends did what all American kids did back then in the days of exceptionally cheap gas. “We drove around all the time, after school and after work. We’d scoop the loop. In our small town, we never called it cruising—that sounded like a California thing,” Craig smiles, recalling the gasoline-infused activities. “There wasn’t that far to go, around the courthouse, the square, and to the north edge of town and back. Sometimes we’d stop at the Dairy Queen,” Craig says, because ice cream and being seen was definitely a part of summer nights. He graduated in 1969, not quite of age to register for the draft as the war raged in Vietnam. But Craig was going to college so there was a bit of a student deferment buffer before he had to worry about getting hauled off into the war. He attended Iowa State in Ames, and having no idea what he wanted to do, he decided to try aerospace engineering for the first year. Realizing he wasn’t cut out for that sort of discipline, he quickly reevaluated and switched to business. He recalls the time he first heard the influential harmonies of Crosby, Stills and Nash blaring from speakers set on open windowsills of dorm rooms. Post-dorm life, Craig moved into a house with eight of his buddies. “It was hilarious, it was such a mess always. I clearly remember going upstairs into the attic with our guitars, me and my friend, and banging out two chords,” he says of the repetitious mode of beginner musicians. By this time, the lottery for the draft was in place and Craig had drawn a worrisome low 190 in the queue. He still had his student deferment, but he didn’t want to go back to school because he wasn’t doing well and he certainly wasn’t having any fun. His draft advisor felt that even though his number was low, he didn’t think Craig would get called in. So Craig took his chances and left school to work at a junk mail factory. “The machines would shove all those coupons and samples into the envelopes and I would sort the bags for delivery to the post office,” he says. He worked mostly among farmers’ wives, who were working to help support the family farm. One summer, Craig decided to cave in to his wanderlust and hitchhiked west with a friend to Washington State, down the coast to northern California and back. “It was a wild journey and the next summer I left Iowa and drove through Colorado to Los Angeles. We came through Denver on the way back and I didn’t want to go home,” Craig says. While at a Red Rocks concert seeing Arlo Guthrie and Pete Seeger, their car was broken into, his guitar and harmonicas were stolen, which worked out very well since Craig was able to buy a new Yamaha guitar with the insurance money. In 1972, he recalls, “All the hippies had come down from the Rainbow Gathering and were all over the place in Denver and I thought, this is the place to be.” He rented a cheap room at the Antlers Hotel, just off Colfax, but the place was rather sleazy and he relocated to an apartment. “I was working at a machine shop, where I’d take little pieces of metal and buff out the beveled holes in them,” he says, until one day, his long hippie locks of hair got caught in the machine and ripped a chunk of scalp with it. He quit soon afterwards and went back to Iowa. Life wasn’t going quite the way Craig had envisioned. He had returned to work at the factory, stuffing junk mail bags, when he met a drummer, also a co-worker at the factory. The drummer’s Los Angeles guitarist friend invited him to play California gigs, so Craig tagged along, occasionally playing harmonica at rehearsals since he wasn’t officially in the band. He got a delivery job that paid $2 an hour to pick up parts for engineers. “Sometimes I’d drive 200 miles to deliver a little transistor part,” he laughs, but even at the miniscule wages he was making, he managed to save up $700 to buy a new acoustic Gibson guitar, which he still has. He and the drummer moved up to Box Canyon, the north end of San Fernando Valley. “There were musicians all over the place. It was close to Topanga Canyon where Joni Mitchell, Crosby, Stills and Nash, Jackson Brown, and some of the Eagles all lived,” he says of the place put into song by Joni Mitchell in her “Ladies of the Canyon.” But Craig once again had to move back to Iowa for a few months, a short-lived stay in his home state before heading off on another road trip that landed him in Aspen, living at Mrs. Max Snowchase Lodge, a bunk-bed kind of place with a common kitchen, that sat at the top of Mill Street at the base of Ajax. It was $15 a week per person to live at the lodge and in the evenings, they gathered to jam. It was there that Craig was first introduced to bluegrass music. “I learned a few basic bluegrass songs and played with a fiddle player, and performed at my first-ever open mic show, where all I did was strum guitar,” says the man so terrified of being in front of people that as a youth, he made his mom write a note to excuse him from singing in the school choir. In the autumn of 1976, he moved to Whitefish, Montana, because Aspen was already beginning to get too crowded and glitzy and he wanted an adventure different from what Aspen could offer. “I had read about intentional communities and wanted to be where there were more back-to-the-land opportunities. I wanted to be back into nature. I had a 1950 Chevy pickup with a wood camper that I had built out of scraps. I used old metal printing sheets from the Aspen Times that they put in the trash weekly, so I had the print of the newspaper for roofing. The camper was so heavy that it killed my engine. I had to rebuild it after I got to Montana.” He stayed for five years, a relatively long time for a wanderlust mentality. It was 1981 when Craig was hitching around, went back to visit Aspen, and backpacked over to Crested Butte after soaking in the Conundrum hot springs, seeking a place in Colorado to live. He immediately felt at home in Crested Butte but headed off to Telluride to explore. He soon realized Crested Butte was what he was looking for, “so I hitched back to Whitefish, got my old Chevy truck, packed it up and moved to Crested Butte,” landing at the Zinc Building while working in the kitchen of the Eldo, where he started an open mic night the following year. When food orders at the Eldo were slow, he’d grab his guitar and play in the back. One day, after hearing Craig play, Jim Deli encouraged him to move to the front of the house where the stage was and local musicians like Tracey Wickland would perform. 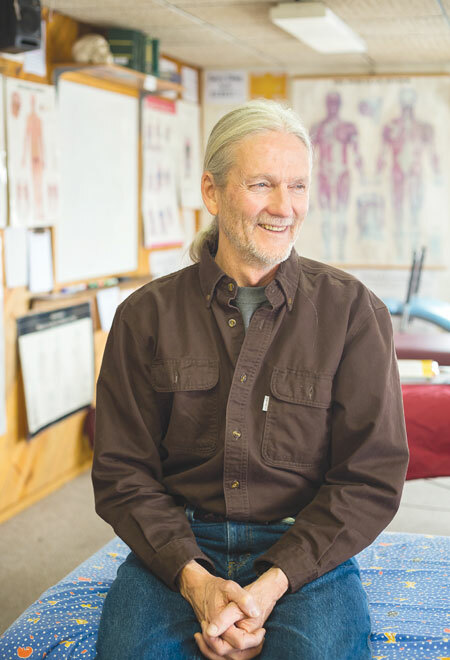 Wanting a total change once again, Craig moved to Boulder in 1985 and began doing bodywork alongside of a chiropractor. At the same time, he was assisting at workshops around the Denver–Boulder area to gain more experience and eventually became certified to teach those disciplines. Although he stayed in Vail for six years, where he helped a friend start a massage school in Fort Collins, Craig signed up to teach there, creating classes and directing their body-mind therapy. He moved up to Rist Canyon in a little cabin with the eventual mother of his kids. They married in 1995 and their daughter, Mara, was born the following year. Now in fatherhood, he decided he needed to live in a community like Crested Butte, so Craig brought the new family to town in the spring ’97, where he cranked up the MountainHeart School of Bodywork, with the first classes beginning in June 1998 and offering two sessions a year ever since. Students attend from all over—Korea, Netherlands, East and West Coasts—but the majority are from Colorado. That second year back, Craig went to the open stage performance at the Crested Butte Center for the Arts and was thoroughly inspired by Kevin Donovan and Karen Janssen performing. Eventually he and Kevin started playing together. Craig attended the Rocky Grass Academy and that reignited his interest in bluegrass. He met local fiddler Lizzy Plotkin in 2012 and the two booked weddings, bar and random gigs together. Craig would also be motivated by all the festivals he attended, playing in the campground circles.